It is Monday, the last day of July. Outside I can hear birds singing their summer songs while the sky seems to be a pale watercolor wash of blues and grays, hinting at storms far out to sea. The days have tumbled to the end of a month long celebration of World Watercolor Month. My Stillman & Birn sketchbook is nearly filled and is a delightful souvenir of this month’s adventures with watercolor, exploring old ideas and discovering a few new ones. As always, events such as this are fun and inspiring, especially when seeing so many from around the world participating in the creative joy of painting. I hope everyone else who participated had an enjoyable celebration and is ready for more watercolor adventures in the months ahead. How quickly time flies, as swift as an island trade breezing off the ocean, brushing past for a cooling moment and then gone. As week three of celebrating World Watercolor Month nears its end I cannot help but look back and wonder where did the time go? All that I have are small painted sketches to remind myself of the days now turned into memory. This year I am painting in a smaller format, wanting to fill out a Stillman & Birn beta series hardbound, (5.5 x 8.5) sketch book, and limiting myself to the paints from an old Winsor and Newton watercolor field box. The paper I use most often is Arches 140# cold press, and my palette is filled mainly with transparent watercolors from Daniel Smith and M. Graham. So other than the smaller size, using a different palette has been a bit of a challenge. I have also been using my Pigma Micron ink pens. Something about the format makes me want to doodle with ink, and it has been fun. Hope everyone is having just as much fun celebrating the month with watercolors, and of course, with cooling breezes to keep you company and help the paint dry. Last night I heard the passing warble of a Pacific Golden Plover, (Pluvialis fulva), or, as we call them, Kōlea. The name is an onomatopoeia that copies the plover’s flight call. A timely reminder that April 8th is Draw a Bird Day, a monthly event in our blogging community formerly hosted by Laura at Create Art Everyday, and now cared for by Nina and Kerfe at Method Two Madness. The Kōlea, navigator, messenger from the gods, guardian spirit, a god incarnate, and a familiar island guest, have wintered here long before man stepped foot on these sandy shores. Many believe the birds helped to guide early Polynesian explorers here and elsewhere in the pacific so it is not surprising they are part of our earliest oral history and even down to today they remain part of our belief system. These amazing and mighty long-distance flyers, not only find their way back to tiny little specks of lava rock in the middle of the ocean, but they also find the same specific wintering grounds in the islands each year, … such as someone’s backyard. There is a record of a banded Kōlea returning to the same site for over 20 years. No wonder many island residents become attached to seeing their guests arrive year after year. Most Kōlea have fattened up and their plumage has changed from the golden sandy colors they arrived with in the fall, to more striking breeding plumage complete with a white racer stripe. By next week a few will start to leave, and near the end of the month, large groups will depart on their arduous non-stop journey to as far north as the Arctic tundra. Hello and welcome to the beginning of my blogging journey. 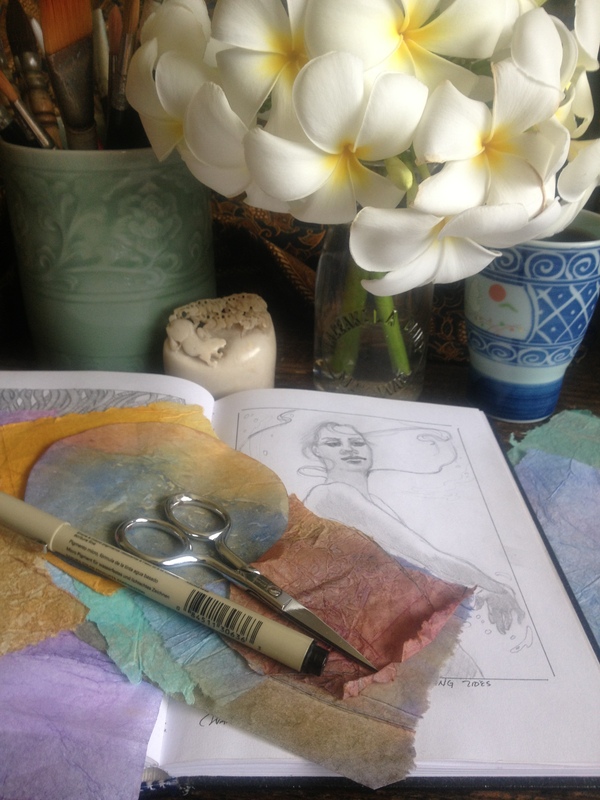 Pull up a chair and sit with me in the studio where I hope to share my art projects and process. Or, join me while I collect inspiration, follow Moon dreams, and explore the landscape of a creative life.